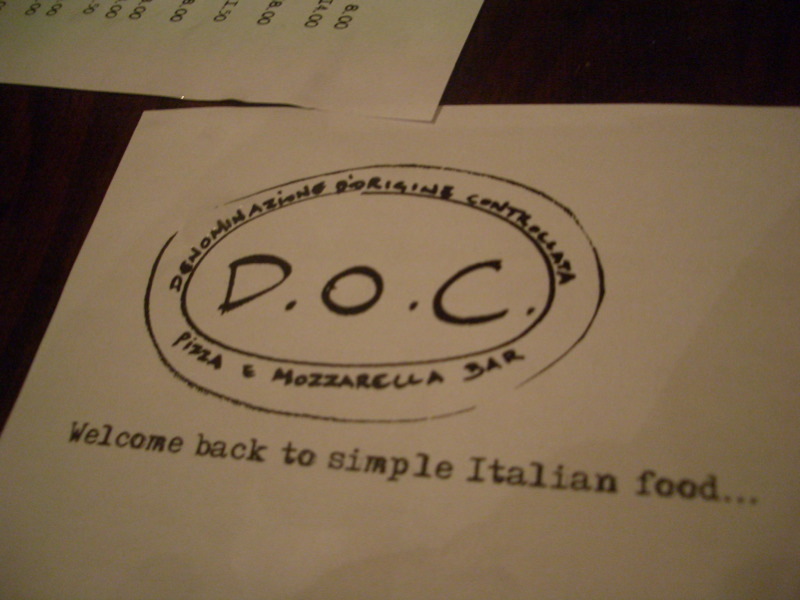 melbourne gastronome: D.O.C. 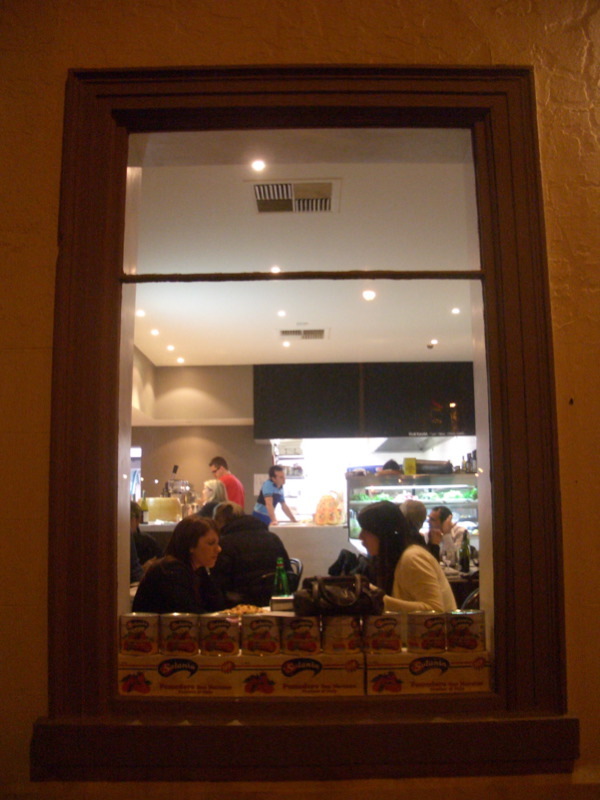 : Melbourne now has a mozzarella bar! D.O.C. 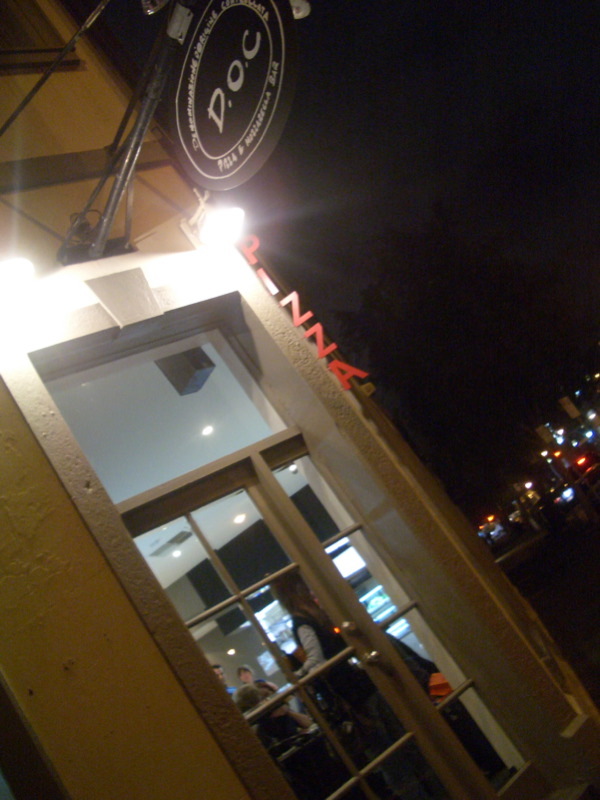 : Melbourne now has a mozzarella bar! (b) because D.O.C. is a pizza AND mozzarella bar! What can I say, I'm a sucker for a niche gimmick (and for good mozzarella). The NY Times reckons the world's first mozzarella bar started up in Rome a few years ago. Well, now it's Melbourne's turn, and on Friday night I went to check it out with four friends. I was not disappointed! 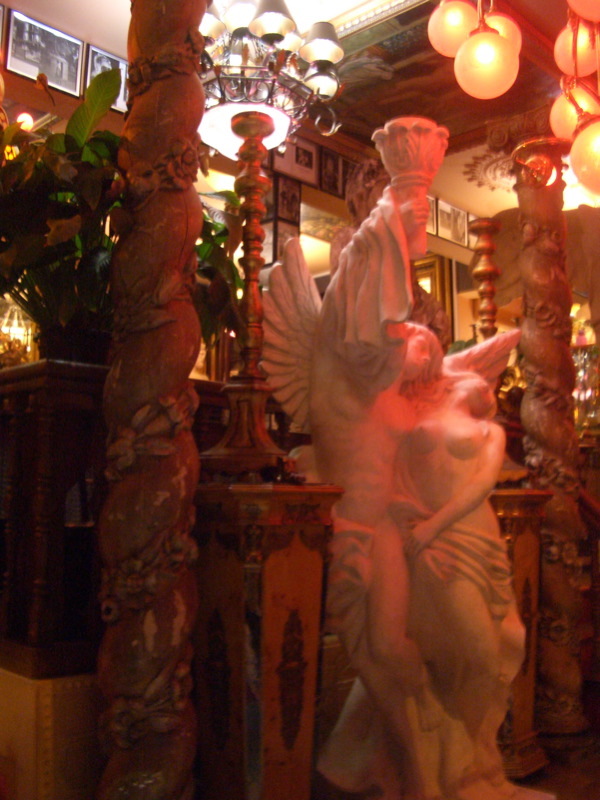 First up, we went for a drink across the road at Il Duce Si Diventa. Having just been paid that day, I was looking forward to spending a tidy sum on a delicious red, quite probably a pinot noir - so was less than impressed to find that the red wine list at IDSD consisted of a Penfolds Cabernet... and a Penfolds Merlot. Bah! I had a beer instead. Purely coincidentally, I discovered that Friday was the one year anniversary since IDSD opened. 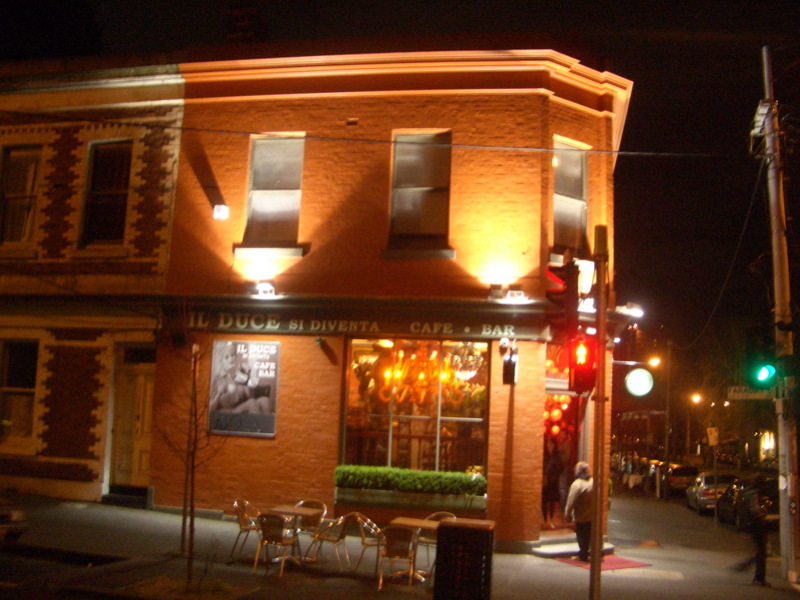 The bar caused a minor furore amongst the Italian community in Melbourne when it opened due to its name ("Il Duce" was Mussolini's de facto title, and the name of the bar (very) loosly translates as "(You're not born Il Duce), you become Il Duce"). SBS Italian radio interviewed the bar owner at the time and questioned him about the bar's name, asking him whether he would think it appropriate for a German to open a bar called Hitler Si Diventa. "Look... Hitler is Hitler, and Mussolini is Mussolini" was the reply from the bar owner, who was quick to point out that he wasn't a Fascist sympathiser. 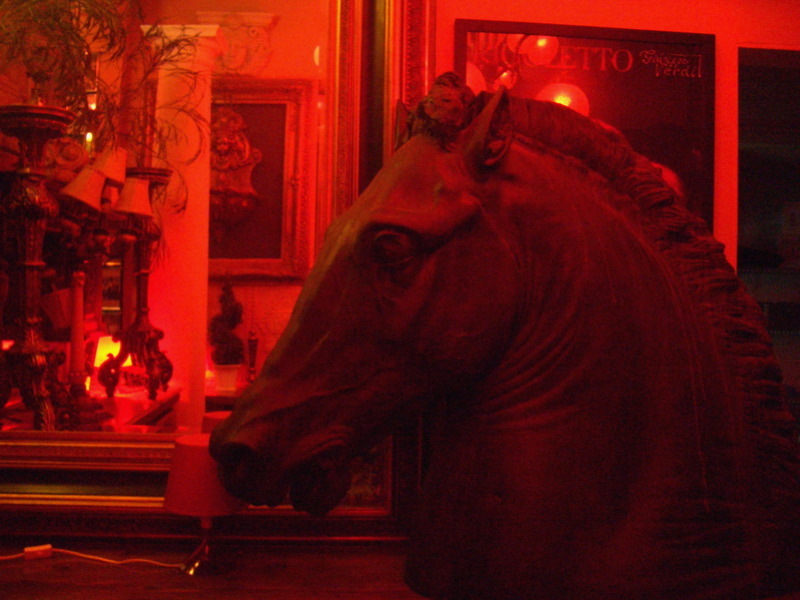 The interior decorating scheme of IDSD (described with generous understatement as "decadente" by SBS Italian radio) consists of getting enough kitsch, gilded, gaudy, over the top miscellanea to fill six houses, then cramming it all into one small bar (with strangely uninspiring results - as my friend M said, never has so little been made of so much). 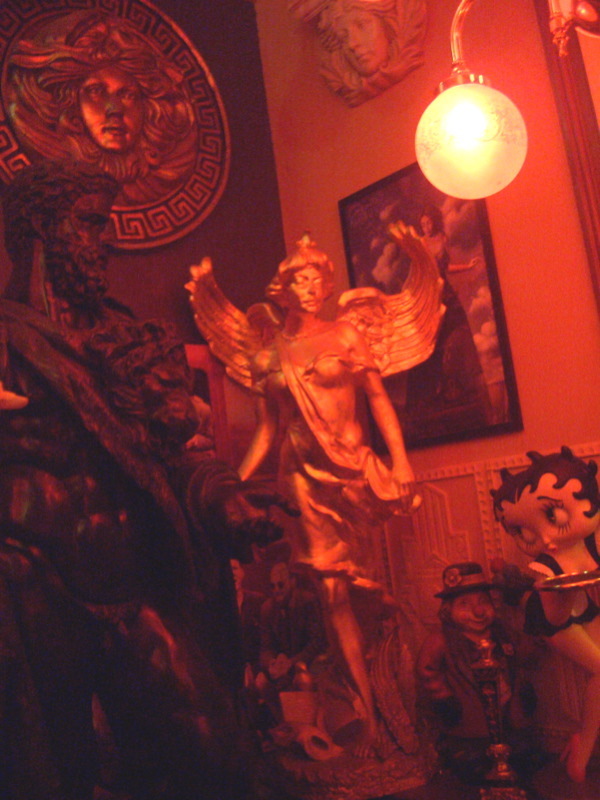 I DO like kitsch in most instances, but after a visit there my eyes felt like they'd been raped. It's not really my kind of place. After one drink, we crossed the road and entered D.O.C. (no bookings, sorry). D.O.C. 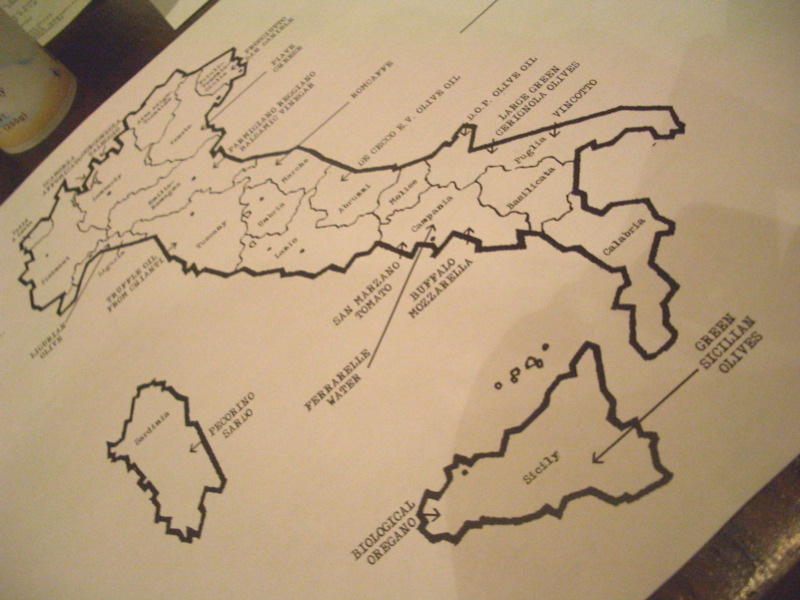 stands for Denominazione d'Origine Controllata, the Italian appellation given to wines (and foods) from controlled regions. There are many DOC wines on the wine list, and plenty of D.O.P. foods (Denominazione d'Origine Protetta) including mozzarella, San Daniele prosciutto and gorgonzola. Of course we HAD to start with something from the mozzarella bar section of the menu. You get your choice of a big juicy ball of either Australian Fior di Latte or D.O.P. Air Freighted Italian Buffalo Mozzarella accompanied by a little something on the side such as spek, bresaola, D.O.P. San Daniele Prosciutto, tomato with pesto etc. We chose the Italian mozzarella (natch) accompanied by White Sardinian Anchovies, which were brilliantly matched with shaved fennel and whisper-thin slices of blood orange, and some grissini (excuse the shaky photo!). 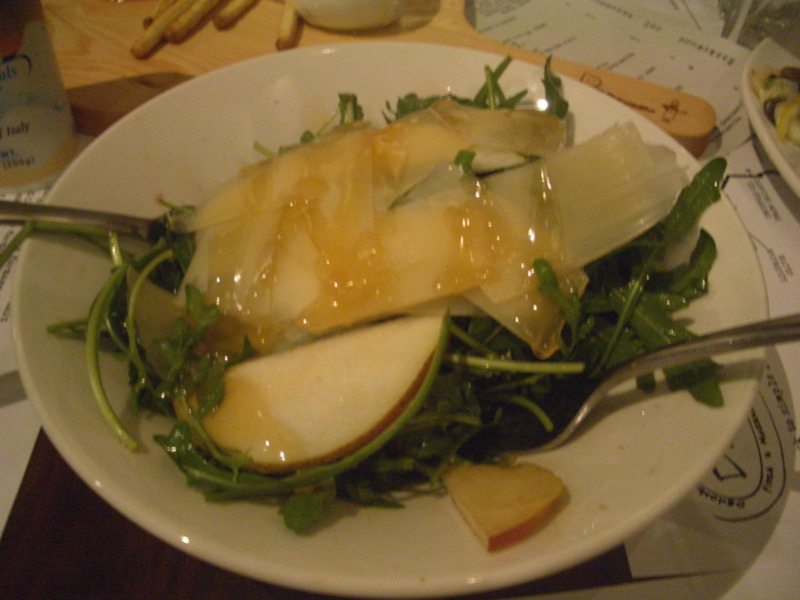 We had a big salad (insalatone) of rocket, pear, warm honey and Sardinian pecorino. Also fantastic - having the honey slightly runny was the crowning touch. We shared three pizze amongst us - the first one I'd had and loved before in by-the-slice format at Carlton Espresso: the Pizza Cicoria with chicory, piave cheese and lemon. 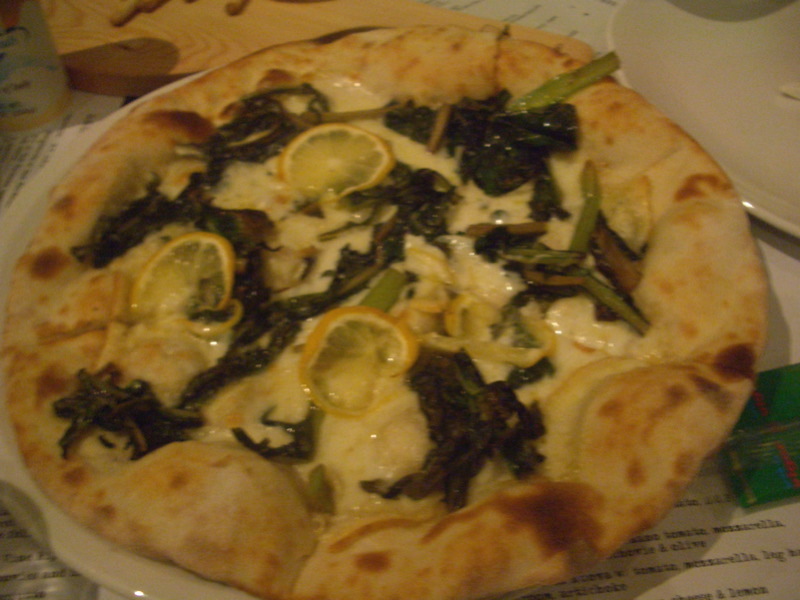 There are very few pizze that use lemon successfully - this is one of them! 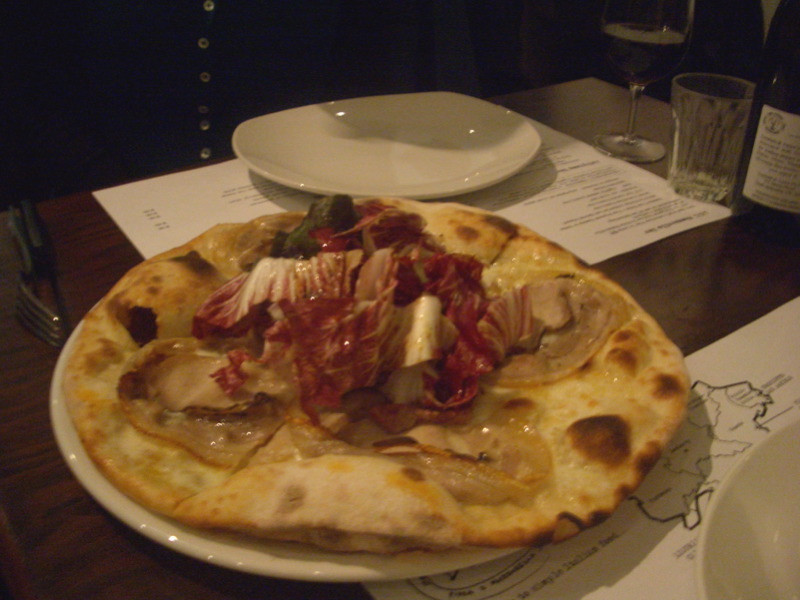 ...the Pizza Abruzzese with porchetta, mozzarella, torre di radicchio and mostarda di frutta (an Italian fruit relish often flavoured with mustard). The saltiness of the porchetta offset the spicy bitterness of the radicchio wonderfully. 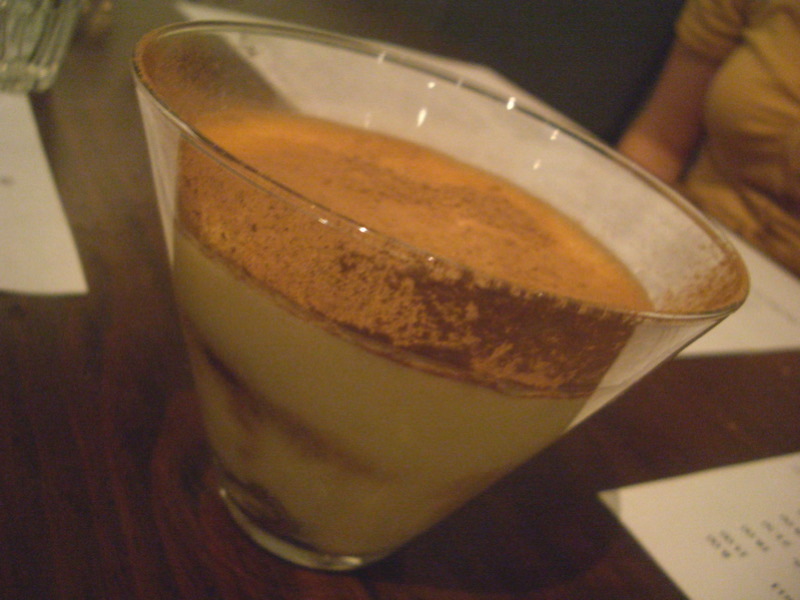 Having washed out savoury food down with a Dolcetto d'Alba (from Piemonte), we turned to the dessert menu. My curiosity was piqued by the Sweet Goats Cheese Tiramisu with Pavesini - I couldn't remember ever having goats cheese in a dessert before! We approached the dish with some trepidation, but I'm really glad we ordered it. Although it was very rich, it wasn't heavy. If you took a bit with lots of coffee in it, the nuance of goat was lost, but if you scooped up a coffee-free spoonful, the custardy flavour would yield a slightly goaty aftertaste. Unusual but nice! Can't wait to go back there again. Let me know what you think of it if you go! Thank you for reviewing this place, Mutemonkey! Michael pointed it out to me recently and your description of the dishes has me keen to try it for myself. Thanks for the review! It definitely looks like a place to try. The only thing worse than only being able to choose from a merlot and a cabernet in my books is between a merlot and a shiraz...both ends of the spectrum and nothing in between. Oooh...I so can't wait to go! 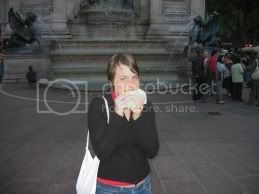 EG mentioned this one to me the other day, and knowing what a huge cheese freak I am, I know it's a place I will love. Thanks for writing up such a mouthwatering post! Thanks for reviewing this...I can't wait to go. wow..sounds like a place that must pay a visit! Went there for lunch today (23/9/07) and found the service atrocious! We had to signal madly for someone to take our order, then despite having written it down, they forgot one of our pizzas and drinks. They were NOT busy, and when challenged, made some excuse about their card machine not working - what's the relation there? The final straw was that they were in no way apologetic, and even tried to charge for the pizza they forgot! Again, when I pointed it out on the bill, they didn't have the grace to apologise for that either. As for the food, it was ok, but not anything to write home about. I certainly wont be going again. Will definitely try this out soon! The pizzas look scrumptious! 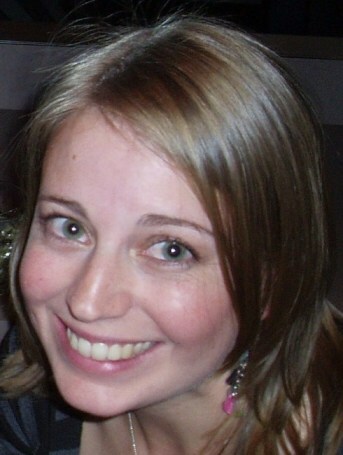 Mellie: Thanks! Glad my post made your mouth water, seeing as your one on Espressino did the same thing to me... I'm going there for lunch on Thursday on the strength of your review! Mouse: As a cheese freak I'm pretty sure you'll like it... you should get both the Australian and Italian mozzarelle and do a side by side taste test - if you do, let me know the result! Ironeaters: Yeah, I liked it. I'd be interested in hearing what you thought of it..
just back from there tonight (1 Oct). I want to go back now, tomorrow is not soon enough! D.O.C does sound interesting, albeit it seems similar to Ladro, and Pizza Meine Liebe in terms of the pizza offered. 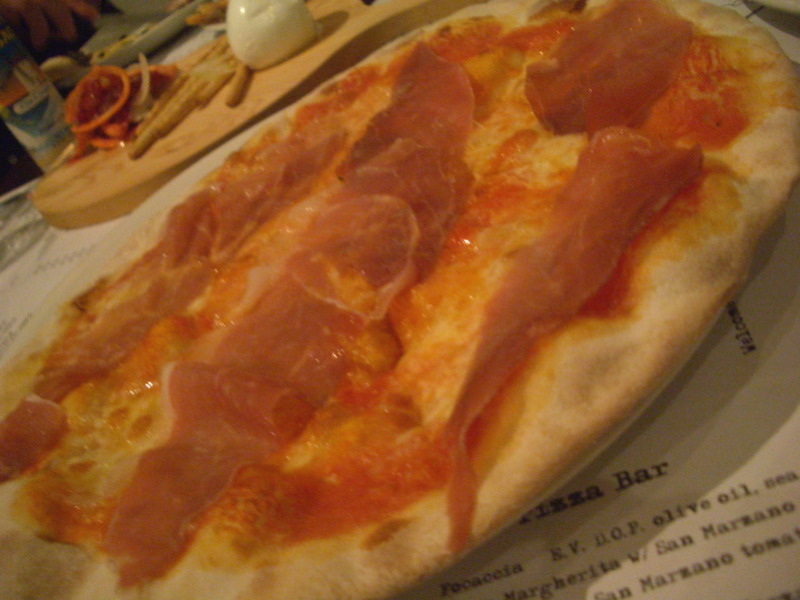 To Ivan it is common for popular restaurants specialising in pizza to offer below par service. I am interested to discover whether the taste of the Buffalo Mozzarella can be detected, and if so is it significantly more desired than normal mozzarella or fior di latte. Was disappointed to see that DOC have replaced their 100% 'Pago' fruit juice (which was fantastic) with a new product in similar-sized bottles, that is only 50% juice and with food colourings - for the same price. The juices are kiwi/apple and blood orange, and contain colours 104, 129 and 133 (all of which are known to cause problems). It's a pity, because for me, it just takes the shine off this place. 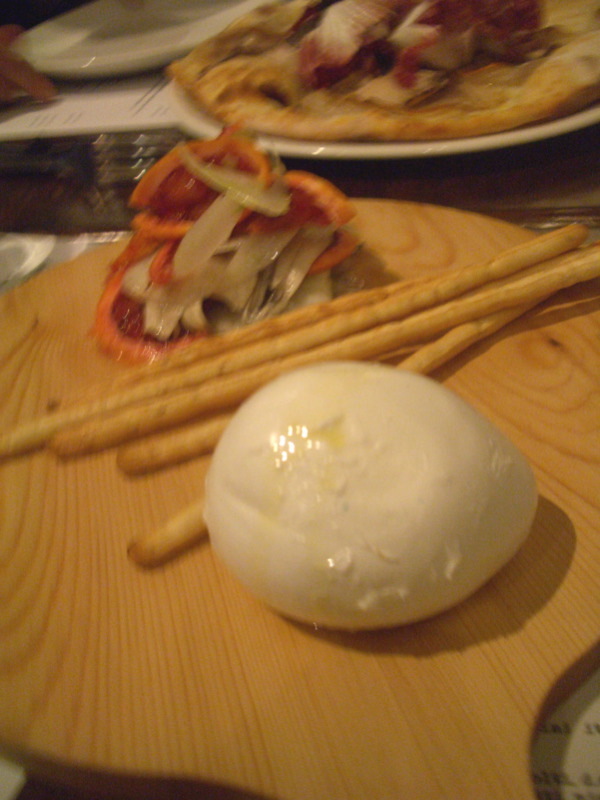 Will still go back there for the buffalo mozzarella, but will stick with water!